Why you need an app and why you don’t? App Builder Appy Pie, Dec 1: Recent research indicates that the enterprise mobile app market is expected to cross the $63 million mark by the year 2020. While we might be going gaga about creating mobile apps for businesses, like most other technological products there are down sides to this as well. 41% of the people who have installed an app open the app for at least 17 times or more, and it is up to the developer to create and ensure a user experience that would make them return asking for more! It is the timing, circumstances and your skill as a developer that would decide where your app lies on this statistical curve. 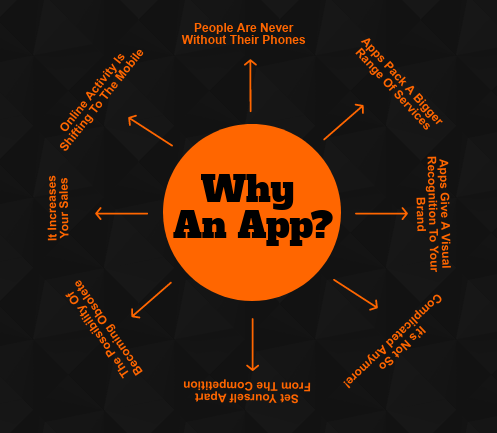 Appy Pie gives you some great reasons for developing your very own app! For small business owners especially, it is not enough to have just a good web presence, as most of the online activity is moving from the computer format on to the mobiles and tabs. The global penetration of smartphones makes it a critical tool for marketing which cannot be ignored anymore. Nearly three quarters of the population with a smartphone checks their device at least once per hour. It has further been established through studies that 90% of the mobile phone usage is entirely made up of the myriad apps that the users have downloaded on them. Smartphones seem to have replaced television in times of the amount of time spent viewing them. Apps reside on one of the most commonly carried device – the smartphone. One of the most convenient places for people to reach or engage with your business is through an app! There are higher chances of someone returning to engage with an app as compared to a website. The ease of use, the access, and the habit of browsing your device for ideas contribute greatly to this. A mobile app has higher engagement potential because it offers to the user a wider range of services within the app. They permit a great variety in the kind of online transactions including but not limited to dissemination of loyalty benefits or cards, push notifications, and even e-commerce transactions with great ease and safety. Apps have the potential to deliver coupons, send announcements that deepen the relationship with the consumer and help you build some sales. It is easier for the customers to get in touch with the company through an app and it increase customer satisfaction through way of instant gratification. One of the salient features of designing an app is to create an iconography that builds a visual memory for the customer. A mere icon on the phone that the customer is looking at frequently is a powerful tool to create a strong brand recognition & recollection in the customers’ memory. It’s Not So Complicated Anymore! There is a very deeply placed myth that creating an app will be a very heavy investment on the time and money front especially for a small business owner. There might be reservation and confusion about the need to build the app for different platform customers including iOS, Android, Windows, and Blackberry. Apart from the indecisiveness about a number of factors including the suitability of a static vs. dynamic app, most small business owners do not have the expertise to build their own app. This concern is now being looked into and helping the small business owners build their own apps by providing them the correct tools to go for their own DIY app to suit their requirements and the limited budget. In spite of all the hullabaloo about the app development phenomenon, there is still a lot of hesitation among the small business owners about it. There are very few players in the world of mobile apps when it comes to the small business segment. This might actually be the right time for you to take the leap and gain on the first movers’ advantage and keep yourself ahead of the times. This might be the one move that would set you apart from the rest of the crowd in your segment. A small business owner who boldly puts themselves out there on the market with such a strong move is sure to incite curiosity and confidence. The fickle world of business is much like a bicycle – if you are not moving forward, you are going to fall! It is not a world for people who fail to recognize the tide of times and adapt themselves to it. As the business community is fast adapting to the mobile platform for a variety of reasons, it would be a disaster to not establish your business and services on this platform. The users today hardly browse the web for any service, solution or even shopping, it is all about apps, and not having an app would simply mean that you would be passed over in favor of your competitors who have taken advantage of this dynamic platform. An easier and smoother experience for the users means that there are higher chances of people actually using that app and availing your services or buying your product. An organization like Domino’s saw a 28% increase in their sales within six months of creating and launching their mobile app and today more than half of their online orders are done through mobile devices. However, if these seem like reasons that are too generic and you are looking for some reasons that you might relate your business to, we have compiled a list of reasons particularly for your business. This list of reasons would give you the much needed guidance to help you take the final decision regarding a mobile app exclusively for your business. Plan an app that would serve a single purpose (They work the best). Are they checking their phones frequently? Are they craving for more of your content? Are they asking for loyalty benefits, offers, deals, or invites? Are they asking for a more efficient customer service? Are they using your competitor’s apps? 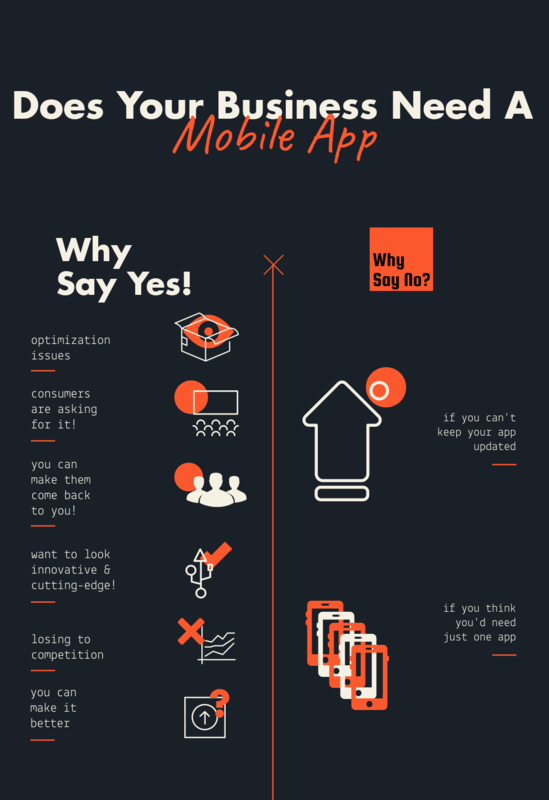 If the answer to most of these questions for you is ‘yes!’ it is time you launched your app. A battle well begun is already half won! If you are one of those lucky few, who have an idea for an app that would keep the people coming back for more, you definitely have half the battle in your bag. There’s no point waiting anymore. However, if you do not then it is time you come up with ways that would make your app engaging enough to make the users long to come back to it. In this day and age, there are very few people who can be considered cutting edge or innovative if they are not going mobile first. A business that has been using apps indicates that they are willing to innovate instead of sticking to the norm. Sometimes even when we do not have a perfect use for the app, you may be using it only for the wow factor and there’s nothing wrong with that at all! Innovation becomes an absolute necessity when you see the competition updating themselves to new technologies. The request and questions for updating to new technologies would start coming up more frequently as the technology around you begins to grow. It has oft been established resoundingly that enterprise mobile apps are a strong means to drive competitive advantage. The reason “others are doing it” mind sound puerile, but is actually a good one! The cost and time demands of maintaining an app is no longer a pain and the new age low or no code platforms can make it easy breezy for you too! Just having a great idea is not enough at times. A good idea that is implemented badly can in fact be quite a disaster. If you can take an idea and make it better, it is totally worth doing it. Even if the earlier solution was working perfectly well, there is a good chance you know what you can add to it, and give you an edge. While these are some great reasons to make you call an app developer, consider this list of situations when you don’t need an app! Even after the app has been launched, it is inevitable that you’d need to update and maintain it. It is a good idea to have a conversation with the agency or developer that you hired to build your app with regard to the kind of time and cost investment involved in some update scenarios, before you go on to hire one. You might feel accomplished in launching your first app, but to expect that one app would suffice all purposes is a misplaced notion altogether. A good app is effective only when it is focused on a specialized aspect of the business. This is the reason that an average company built more than 10 apps in the last year. While at the initial stage, it might be okay to have just the one app, but it is advisable to plan for the management of multiple apps that would cover a great number of specialized aspects of your business. These reasons can give you a clearer picture of the scenarios where you do and do not need an app. This will help boost your confidence in launching your first enterprise app and help you reconsider in the scenarios where you shouldn’t.